Who are the Swiss Amish? The so-called “Swiss Amish” are not a separate affiliation of Amish. The term rather refers to Amish who originate from a group of settlers who came to America mainly in the early-to-mid-1800s. Swiss Amish customs, language, open-top buggies, and last names set them apart from Amish of Pennsylvania German descent. Swiss Amish began arriving in the Midwest in the 1830s, settling in Adams and Allen Counties in Indiana by the early 1850s. Most were first-generation immigrants from Switzerland and neighboring areas in Europe, unlike many other Amish moving to the Midwest in the 1800s by way of settlements in Pennsylvania. Swiss-rooted Amish distinguished themselves in plainness of appearance, a trait that they have retained to varying degrees today. In Plain Diversity, Steven M. Nolt and Thomas J. Meyers note that their differing roots meant that Swiss Amish had little in common culturally with Pennsylvania German ethnicity Amish, leaving them relatively isolated in Amish society. Adams and Allen Counties grew to become the two largest Swiss settlements today. They have also contributed settlers to other communities, notably to the Daviess County settlement, to which Amish from the Allen County settlement moved in the late 1860s. Though this community had a “Swiss” heritage in its earlier years, Meyers and Nolt describe numerous changes including the Pennsylvania German dialect displacing the Swiss dialect, as well as adoption of closed-top buggies in 1990. These and other reasons have led the scholars to describe Daviess County as “Swiss and not-Swiss”. Swiss Amish are distinct from the majority of Amish, who are referred to as being of “Pennsylvania German” ethnicity. They may do business together and cooperate on certain issues but typically do not intermarry. Where do Swiss Amish live? Today, Swiss Amish are found in over ninety church districts in around 20 settlements. They populate over a half-dozen states, though the majority are found in Indiana (Plain Diversity, Nolt/Meyers). The most prominent Swiss Amish communities are at Adams County and in Allen County, in Indiana. The Adams County community (founded 1850), centered around the towns of Berne, Geneva, and Monroe, is the largest with 47 church districts as of 2008. The Allen County settlement (founded 1852, 19 church districts), is centered around the town of Grabill and abuts the large urban population of Fort Wayne. Allen and Adams counties are distinct from one another in certain ways, though the communities are “back-and-forth” with one another. 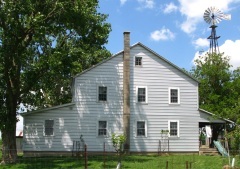 The appearance of homes in Allen County, many of which are constructed of brick, as well as the well-kept carriages, for example, gives the impression that there is more wealth and more of an emphasis on a neat and tidy appearance in this community, compared to the generally plainer dwellings found in Adams County. These communities also have numerous daughter settlements in states including Michigan, New York, Missouri, and Ohio. The Swiss Amish speak a different dialect than the Pennsylvania German ethnicity Amish. The Pennsylvania German dialect emerged from a mixing of a variety of German dialects in the New World, while the Swiss dialect originates directly from the European homelands of Swiss Amish immigrants. However, Nolt and Meyers note that this language is not identical to that spoken in German parts of Switzerland, though it is closer to that dialect than the Pennsylvania German dialect (Plain Diversity, Nolt/Meyers). They also point out that “most Amish have some difficulty understanding the other dialect”, but that Amish indicate that “Swiss people tend to pick up Pennsylvania Dutch, but Pennsylvania Dutch speakers rarely learn Swiss” (Patchwork, Meyers/Nolt). Another Swiss Amish identity marker is the practice of yodeling, most commonly seen in the community at Adams County. Meyers and Nolt note that “the repertoire of yodels includes folksongs such as “Mi Vater ist en Appenzeller” (My Father is from Appenzell), or lyrics wistful for the Alps.” (Patchwork, Meyers/Nolt). They note that Amish have composed some original yodels but most hail from Europe, with “playful” wording that is not especially religious. Some yodels are of English origin, such as “I Left My Gal in the Mountain” and “Yodel Sweet Molly”, with secular lyrics and elements of love songs (Plain Diversity, Nolt/Meyers). Pennsylvania German heritage Amish do not yodel. Another specifically Swiss practice is that of burying the dead in graves marked only with wooden stakes. Nolt and Meyers indicate that they include only the initials of the dead. Over time these headstones wear away, emphasizing the transience of life and insignificance of the individual. Swiss Amish publish a cemetery guide indicating the location of the deceased, as well as location of lost body parts. In contrast, Pennsylvania German Amish bury their dead using simple headstones including the full name and dates of birth and death. 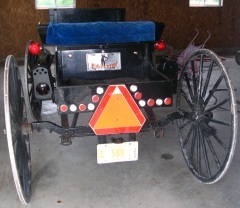 Another custom of the Swiss Amish is the use of open-top buggies. 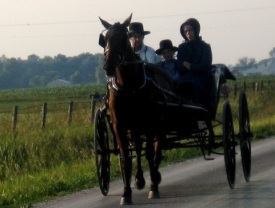 Though Pennsylvania German Amish will use open carriages, Swiss Amish do not allow closed-top buggies. Allen County carriages tend to be of a finer appearance, and may include the so-called “kid box”, a small compartment in the back where children can sit to avoid rainy or snowy weather. Swiss Amish make use of umbrellas to protect themselves from inclement weather conditions. Swiss Amish tend to be more restrictive in technological matters. Meyers and Nolt note that they “have tended to stick with traditional power sources such as windmills or small engines rather than adopt hydraulic power or energy from compressed air that has been accepted in many Pennsylvania Dutch districts” (Patchwork, Meyers/Nolt). Outhouses may be seen in Swiss settlements. Swiss Amish also have distinct names, many of which are uncommon among other Amish. These include Schwartz, Wittmer, Lengacher (pronounced “Lon-a-kerr”), and Hilty. Swiss and Pennsylvania German Amish typically do not intermarry, though Nolt and Meyers note that the community at Milroy, founded in 1970 in central Indiana by Pennsylvania German Amish, has seen a significant influx of Swiss Amish. Nolt and Meyers further note a strain of Swiss traditionalism that has been seen in everything from their approach to technology, family sizes that have remained large even as other Amish groups’ families have slightly decreased in size, to a history of doctrinal traditionalism that has seen them maintain strict shunning (streng Meidung) even as other neighboring Amish groups have discarded it (Plain Diversity, Nolt/Meyers). Outside observers, Amish and non-Amish alike, have noted that Swiss Amish tend to be somewhat more difficult to approach and to engage than Amish from the Old Order Pennsylvania German heritage, likely reflecting their traditionalism and history of isolation in Amish society. 46 responses to Who are the Swiss Amish? I need a Swiss Amish/English interpreter! I work in a large health care system which serves some of the “Swiss Amish” who have settled in Missouri. We have a great need for an interpreter to help with some mental health work. I am striking out with the largest interpreting companies in U.S. Can anyone steer me to someone there in Indiana? There are tens of thousands of (non Amish) Swiss German immigrants throughout the United States. The Consulate in Chicago could put you in touch with the local Swiss community. The phone number for the Chicago Consulate General is 312.915.4500. I have contacted someone, but we need to know how to contact you. Please send a email contact details to followjesusonly@gmail.com and he will try to help you. Lance, you must be working with the Swiss Amish east of Springfield. If so, I might be able to help you with translation, if youo still need someone. I life just outside of the city of Springfield. Look me up in the white pages. I live near a new “daughter” community (since 2006) near Parsons KS of the Seymour (Springfield) MO Amish. I know German but their Swiss dialect is difficult to pick up on. I would like to learn it better though. Any “English” out there who could help me? Thanks. Not sure about how much the dialect there has morphed from Swiss-German and there are very few books written about Swiss-German, as it is a spoken language (although the kids today write it phonetically for texting and social sites) but there is something that might help you as a place to start. There is a little book in English called “Hoi, your Swiss German survival guide.” by Sergio J. Lievano and Nicole Egger. As it is written phoenetically the pronounciation will be easy for you to read and pronounce. I find Swiss-German much closer to English than High German and the grammar rules are so much easier. You exactly writwe what our teacher said us 20 years ago at college. Swiss German and English are very close! Swiss German is very simple. We just use one past form, the perfect. There is no past form as in High German. We just say ex. I have seen (i ha gseh) but never I saw. I know this post is old but if you write in Swiss-German there are no grammar rules you write the way you think is best! I was just a go-between. I never heard if Grace Vega ever contacted the person with the email address. Comment on who are the Swiss Amish? My husband is from Switzerland and years ago we were in Lancaster County PA. My husband had no difficulty whatsoever in understanding the Swiss-German spoken there or in being understood by the people. I have always been under the impression that the reason they are called Pennsylvania “Dutch” is because they used the Swiss-German pronounciation of Deutsch. The German word for “German” is pronounced by German speakers as (phonetically)Doych. Swiss Germans pronounce Deutsch as Dootch or Dootchy. I believe that the “English” (Americans) living in PA at the time in trying to understand Dootch understood the closest they could and that was the English word Dutch. Anybody know if this is correct? Just my guess. German is a highly diverse language consisting of various different dialects or languages, depending on the view. Even within Switzerland various dialects are spoken. The sub group of languages to which Swiss German dialects belong are called “allemanic”. Besides the Swiss German dialects, Swabian, Alsatian and Western Austrian dialects also belong to this group. This is why Swiss German is mutually understandable to people from the German state of Baden-Württemberg, The Austrian state of Vorarlberg and the French Alsace, but usually not to other German speakers. Some people argue the alemannic dialects form a different language, but the same could be said about the Bavarian dialects in Bavaria, Austria and the Italian South Tyrol or Low German/Plattdeutsch in parts of Northern Germany. On the other hand some people argue Dutch is a German dialect, not a language. It depends on how you define language and dialect. For English speakers this diversity of dialects is difficult to understand as English has many accents, but not a lot of dialects that differ sogreatly form the Standard language. One notable examplemay be Scots, a language or dialect spoken in parts of Scotland. It is related to English but differs considerably from English as we know it. It is not to be confused with the typical Scottish accent a lot of Americans know from Sean Connery and other Scottish actors. They simply spea English with an Accent. Scots has different words and entirly different pronounciation. Also, the Amish living in PA are not Swiss Amish. They are mostly from the Alsace and South West Germany. Your husband probably understood their dialect as many of them also have roots in alemanic speaking Areas, although not Switzerland. Last Thing: Swiss German is not more closely related to English than Standard German. The alemanic dialects derive from Upper German and have some relationship to other Southern and Central german dialects like Bavarian, Palatine German, Frankish or Saxon. English is more closely related to Northern and Western German dialects, as well as Dutch. Thanks Peter for all the info. I would definitely agree that Züri Deutsch is very close to dialects in western Austria as they are neighbors. Each kanton in Switzerland has its own pronunciation of words as well as different words than some other kantons. Contrast “Zwiebel” (Zurich) with “Bolle” (Schywz). The dialect spoken in kanton Valais uses many words from Italian. While I personally find the sound of Swiss German much easier and closer to English than high German, it is not always easy for English speakers to pick it up. The number 2 in Switzerland is pronounced as “zwei”, “zwoi”, “zway”, and “zwoh” depending upon which kanton you are in, so things can sometimes get very confusing. Each day can be a beautiful journey into the unknown for an English speaker living in Switzerland. you are precisely correct , the english speakers couldnt say deutsch so they say dutch , but they meant german not dutch . I have been friends with a Amish family from Seymour you could not ask for better people. We write letters frequently and we try and visit them at least every 2 or 3 months,they share their home food and family with us. They are hard working and the children are very behaved and polite English children could take lessons from them. We have been invited to stay at their home because they were concerned with our driving back across the state. I value the friendship I have with them. I tend to agree with Judy that some simularities between English and Swiss German are apparent. This is especially true for the dialect spoken in the Bernese alps, where by the way a lot of Swiss Amish have their roots. (e.g. Jakob Ammann of Frutigen who’s last name led to the word Amish). In the Bernese alps, a number of old German words are still used. For example the English word JUST is used in the very same manner. Pronounced as IUSHT. Just yesterday = iusht geschter. Another example is some = sumi. SOME say = SUMI säge. Or take the word HAM. In German Schinken, in Bernese HAMME. Obviously HAM and HAMME are closer related than ham and Schinken. Some of these words are nowadays only used in remote areas, where the older words have a better chance to survive. But they show,that a number of words have the same old German roots. He was from Erlenbach im Simmental not from Frutigen! I do not agree with “just”. As you know there were many Hugenottts coming from France to the Canton of Berne in the 17 + 18th Century (all the Marmets, Donzés nowadays….). From them and from the Napoleon Soldiers we use now a l lot of french words in Berndeutsch. And just is actually a latin/french word (juste). A few years I was traveling with some Hutterites (Dariusleut from Montana and Alberta). We were on our way to a Hutterite teacher’s conference in South Dakota. We stopped for a few hours to visit the Devil’s Tower National Monument in NE Wyoming. As we were hiking along a trail near the base of the “Tower” we encountered a Swiss tourists couple from Appenzell Canton. Out of curiosity I asked a Hutterite friend from Alberta to ask the Swiss couple something in Hutterisch. Is there anyone “out there” who might know if the Hutterite dialect is also closely related to the Swiss-Amish dialect of German? Actually not because Swiss-German is mostly alemanic as spoken in the Southwest of Germany. Hutterite dialect is as you wrote an Austrian-Bavarian dialect spoken in Tirol, South Tirol and Carinthia. But from my own experience I can say to you that I am understood in Austria and the Soutwest of Germany (incl. Alsace which belongs to France now) when speaking Swiss-German (Bernese Dialect). But normal High-German speaking Germans do not understand Swiss German. They understand some words but mostly not the whole context. Concerning the Appenzeller Dialect I have also sometimes Problems to understand them because of their cadence. I even have trouble understanding their sermons (Lehr) that date back to over 400 years ago. This principally because their sermons follow the Swiss Fruschauerbilel–and even the High German used in their sermans and German school follow an older form of the Lutherbibel that was not affected by the over-all revisions of the Bible in the 1820s. (I was a Mormon missionary when I was in Germany and read the Lutherbibel every day in my own private study and as we visited Germans each day to discuss the Gospel with them. I was not even aware of the Froschauerbibel and the 1820s revisions until about 1990 when a Lehrerleut minister in southern Alberta asked me to help him translate one of his favorite sermons into English. It concerned the Baumherzigersamariter and I had assumed I would really not have many problems. After just one afternoon of effort I found myself on the telephone calling from my home in Hawaii to Alberta saying: “Reverend Joe. I have a whole string of words and phrases I have never seen before—and I haven’t even finished the first page of translating. I can’t even find them in my thick 1958 edition of “The New Cassell’s German Dictionary.” That’s where I first heard about the Froschauer Bible and the 1820s revision of the Luther Bible. Mr. Schewndemann then wrote “minimum” and “nimmer” on the blackboard using Sütterlin, and told us that every German, Austrian and many Swiss and Italian German-speakers who went to school until 1942 (then, just fifteen years before) learned to write in this manner-and that most of the older people still use this method. His parents were immigrants and he told us that when he learned German from his family as a boy, this was what he had to use in writing out his exercises. Interesting to know Richard! When I first came across your last name, I was a little lost on how to pronounce. It seems you could squeeze at least 4 or 5 different pronunciations out of it 🙂 I’m sure I said it wrong the first time but the Amish folks I was dealing with set me straight. The first a as in “Mac”, the second a as the first a in “Adam”, the ch as a fine k (ch can not be translated to the English, in German it sounds like a fine spoken k) and the e as an o in “second”. It is most interesting to hear the various inputs..
Richard, I have found your posts to be very informative. My wife is descended from the Lengachers around Grabill also. Her ancestor was Christian Lengacher/Longacher who died in 1890. His family was also from Aeschi by way of Alsace I believe. My email address is kents.family@gmail.com if you care to collaborate on this family. We are also headed for Aeschi, Frutigen, and Adelboden where my wife’s ancestors all lived. We will be there this September and October. Would love to meet up with you! I got to know the Amish community in Grabill/Allen County IN when I was completing a doctoral internship in Fort Wayne. I found them to be curious and humble. We hit it off immediately once we got past elementary barriers. I became familiar with business owners, the superintendent of schools, two bishops, and regular folk, as well as their wives. They pleasantly surprised my wife and my family (son and mother-in-law) by inviting us to a hymn-sing which included traditional English, German (or maybe it was one variation of language identified here) and yodeling. To say it was a blessing minimizes my rapture with this opportunity, and the many obstacles that were overcome in this simple gesture of friendship. Next to becoming a doctor and being father to my son, I consider that the third highest honor in my life. I work for Swiss Radio as a US-foreign correspondent. This summer I will be travelling across the country and would like to do to a feature story about an Amish community that still speaks a Swiss dialect (preferably Bernese as that’s what I speak). Does anybody have suggestions as to where to go and who to contact? We will be visiting Switzerland in September and would love to meet with you. I would hate to miss this. If I ever get a chance to visit the Berne area in Indiana, I would love to hear it myself. I live in the Einsiedeln area, and would be very interested in learning when, and which channel on Swiss TV this will be broadcast. I will post a notice when I know more. Waen Ig was frage darf chamme diae saendig au usem usland losae? I wohne in Kanada und freu mi gaeng wenni oebis vom Schweizer Radio DRS etschuldige SRF goerae! This may be a strange request. I got a rescued mule from a rescue in KY. A rescue that gets them out of a feed lot the takes them to Mexico for slaughter. I was told she probably came off an Amish farm in IN. She seems confused and doesn’t seem to understand what I want. Could someone tell me a few simple words she may understand and how to say them to see if maybe she just doesn’t understand English…(I know sounds crazy and my hubby laughed at me but…happened to me in Denmark) like Whoa or maybe stop would be a better word, go, stand, over, up (like pick up you foot) things like these. Must be easy for me to say. Just want to try them on her when I’m working with her to see if maybe that would help. She seems so lost. She is very thin and has scars from harness all over. So if that would help her get use to life here at her new home I would be willing to give it a try. Judy, I will ask my friends to give me the words for these commands. It may be a few days or even weeks before I see them. I will get back to you and I hope it will help! Thank you very much. Though now I’m not so sure she was from an Amish farm. A friend pointed out that Amish know how to fit harness and this poor girl has “scares” from bad fitting harness. So who knows where she came from. But still worth a try. We are getting along so much better too. I spoke to my Swiss Amish friends and they said that they use English words like “Whoa” just like with their horses. To make a horse move forward, they click their teeth and their cheek just like with an English horse. They commented that mules are just stubborn. Hope this helps! Thank you. She is coming along and getting better everyday. I think she was upset and confused and very, very hungry. She has put on over 100 pounds so far and is starting to like me a lot. I just wanted to make things easier for her. When I visited Denmark I brought in from pasture a huge Danish Warmblood horse one time. He was so big I had to run beside him when he was walking! I”m short. I tried everything, easy, whoa, on and on. Nothing worked. Finally I asked someone how do I get him to slow down and stop. The person was by this time really laughing at me and said just say stop! I did and the horse stopped… So learned a new word in Danish stop and means the same in English and worked very well with the horse too! I’m quite certain I will learn lots of new stuff proper here! Swiss Radio published a story on the Amish in Berne, Indiana as part of a broadcast about emigrant dialects. It starts at 9 minutes 30 and is about eight minutes long. Here is the link. By the way: the story is in Bernese dialect. Happy listening! Thanks Priscilla! Will check it out. The Swiss Amish do not speak ONE dialect but TWO quite different dialects, one is from Switzerland and the other one from the Alsace. The Alsatian dialect is spoken in Allen County, Indiana and its daughter settlements. Both dialects are Alemannic. The Allen County dialect is Lower Alemannic, whereas the dialect from Adams County, Indiana is Upper Alemannic. Even experts of the Amish often erroneously state that there is only one Swiss Amish dialect. Leave a reply to Who are the Swiss Amish?